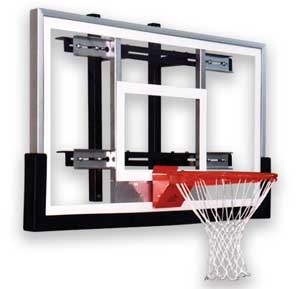 The PowerMount shooting station is designed to allow backboard installations in tight spaces where playing area is at a premium. If your facility requires a backboard installation close to a wall, call on First Team's PowerMount series! The PowerMount structure provides quick and easy installation of a backboard on a wall with a minimal 12" of wall-to-backboard distance. First Team provides an array of prepackaged Powermount options to choose from. The PowerMount can be used with ANY backboard having a standard 20"x35" mounting. However, selecting a PowerMount package is easy and guarantees component compatibility. All PowerMount packages come with a Limited Lifetime Warranty.